The Yankees GM said he doesn't have a timetable for a decision on a replacement and plans to interview candidates from both inside and outside the organization. 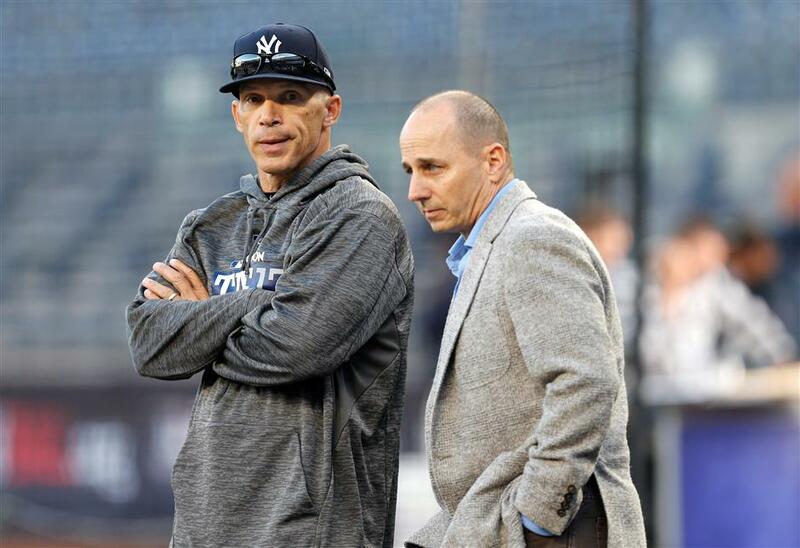 New York Yankees manager Joe Girardi (left) and general manager Brian Cashman chat on the field before the team's American League wildcard playoff game against the Minnesota Twins in New York in this October 3, 2017, photo. Cashman was concerned about Girardi's "connectivity and communication level" with players in deciding to replace him as manager. New York announced on October 26 that Girardi was not being offered a new contract, closing out a 10-year run that ended when the Yankees lost Game 7 of the American League Championship Series to Houston, the eventual World Series champion. Cashman said he informed owner Hal Steinbrenner of his Girardi analysis on October 23, two days after New York's season ended. Cashman met Girardi the next day. "I made that recommendation based on ... some experiences that I was able to validate, whether it's directly or indirectly about the connectivity and the communication level with the players in that clubhouse," Cashman said on Monday in his first comments about the decision. A catcher with the Yankees from 1996-99 who won three titles, Girardi managed the Florida Marlins in 2006. He replaced Joe Torre as Yankees manager before the 2008 season and went 910-710, leading New York to the 2009 World Series title, three first-place finishes in the AL East and two wildcard berths. Girardi was at the end of his four-year contract. The retooled Yankees went 91-71 this season for their best record since 2012, defeated Minnesota in the AL wildcard game and overcame 0-2 deficit to beat Cleveland in a five-game Division Series. Candidates internally and externally will be considered, and each person interviewed will have question-and-answer sessions with media. He is willing to consider people with no managerial experience.